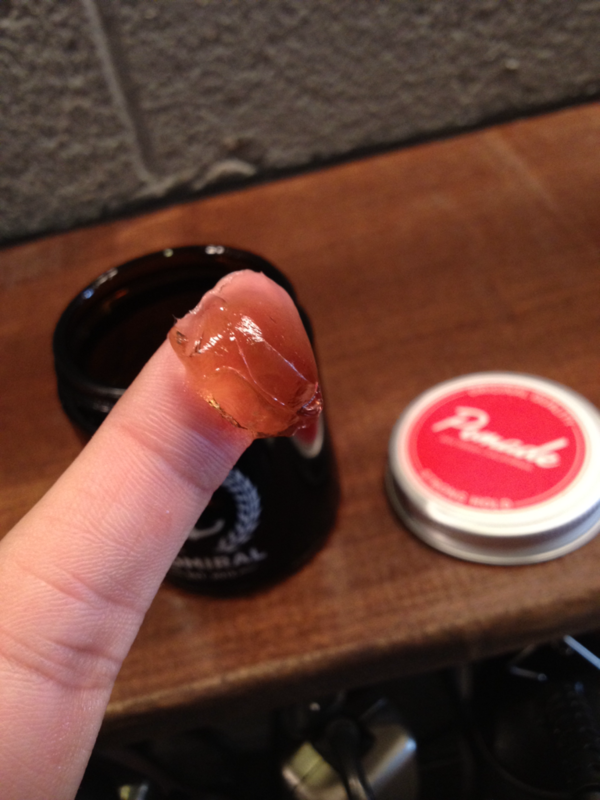 First pomade review of the year! Brett of Admiral hit me up back when I was ready to take the few steps away from barber school, test for my barber’s license, and step into a barber shop. And unfortunately, that frantic time frame meant I wasn’t able to get back to him! But, when a bit of free time opened up I shot him an email and with open arms sent out a jar of his pomade. This stuff came pretty quickly, considering he was shipping it up from San Diego. Now relocated back to San Francisco, I could only imagine how much quicker it would come to my doorstep! Or maybe met up at the bar? Who knows. But, without further adieu, let’s get to the pomade review! 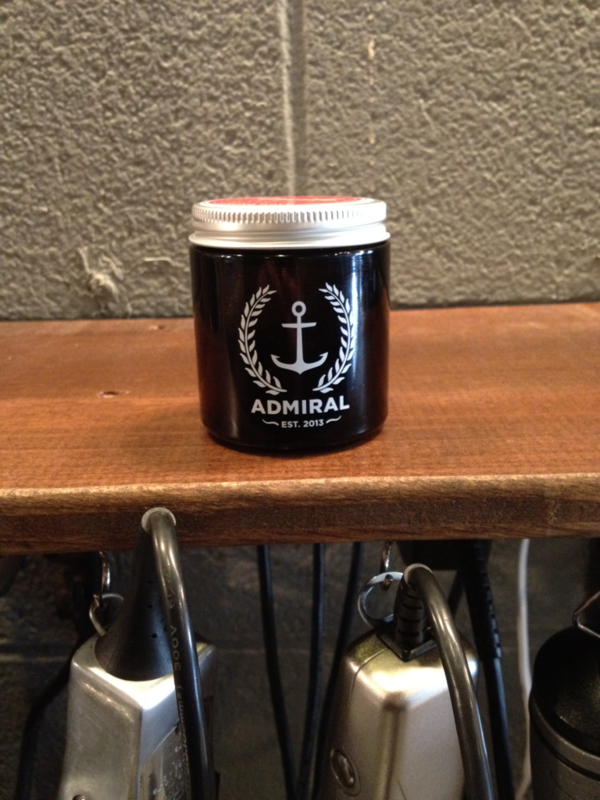 Admiral comes in a nice amber glass jar with a silver tin lid. A clean and simple style of package can go a long way. And the fact that you can use these jars for something else after you’re done with the pomade? And chances are, you’ll have a few empty ones? Man… You can’t beat that! The labeling on the jar is clean, simple, effective, and most of all… proper. Seamlessly printed onto the jar, the white Laurel wreath and anchor logo is perfectly centered on the jar, as well as the ingredient list and barcode. To add a bit of color-flare to the mix, a red and white trim sticker is placed on top of the silver lid. Like other brands with similar packaging (but plastic,) the hint of red really makes the packaging pop. Twisting off the lid, you get a nice whiff of coconut. Now, personally, I hate coconut… Don’t you dare place no damn Mounds in my Halloween candy sack! Fortunately, this stuff isn’t too pungent, so the aroma of coconut doesn’t bother me one bit, instead its subtleties is rather pleasant. 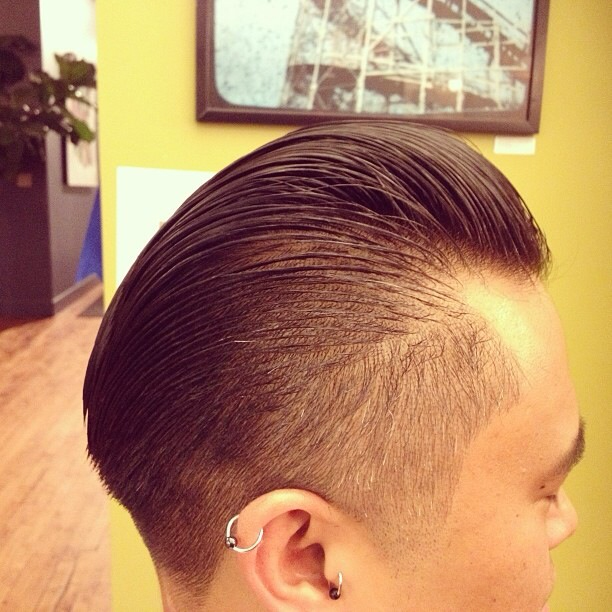 Sorry, no picture of the pomade in the tin, I got too excited to use it on a client! Scooping this stuff out is different than most water-soluble pomades. Rather than feeling like a gel, this stuff comes out feeling really creamy. It may be the hint of beeswax in it, but to the touch this stuff feels really nice, and you can tell it’ll apply evenly and smoothly. But, how does that affect the hold? In terms of wavy hair, I found that this stuff won’t get the hair the straightest, since it isn’t the heaviest water-soluble pomade around, but decent enough to style up a smooth pomp without the waves kicking left and right. 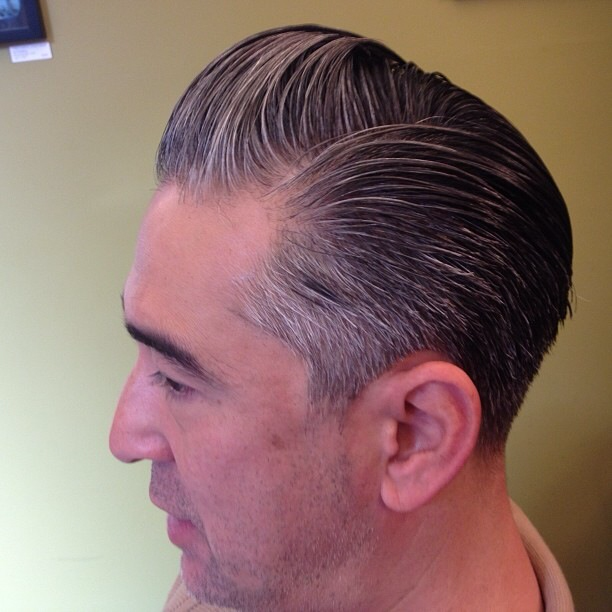 With or without blowdrying, you’ll be able to comb up a nice tall pomp or a lower-profiled side-part. The way this stuff holds and sticks together is real nice. Like I said, it has a creamy feel to it as you scoop it out, which applies to how it’ll hold the hairs together, even the little ones that like to stick out! As most water-soluble pomades go, this stuff has very little to no sheen and does harden (especially with a lot of water in the hair.) But, I noticed it doesn’t get crunchy… Get the difference? The sitff-crunchiness of water-soluble pomades is definitely a turn-off for many, while the hardening can be easily excused. And by that, I mean that when you run your fingers through the hair after it hardens, the now “messed up” hair feels relatively soft and not crunchy… Makes sense? I hope so! I applied this stuff to myself with dampened hair and noticed that it didn’t stiffen like some other gel-type pomades did, but hard enough to give it a solid hold throughout the day without the worry of it splitting apart. Pretty nice, yeah? 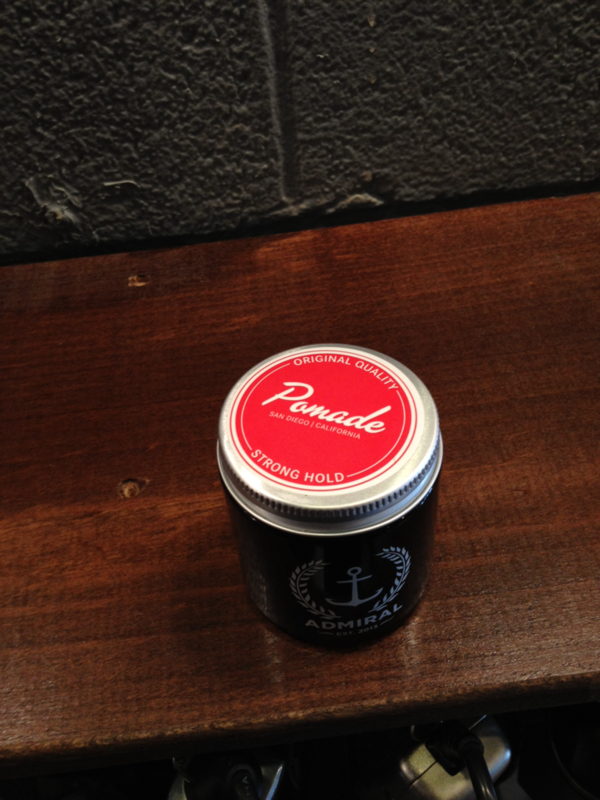 Big thanks again to Brett for shooting me some of his dope pomade! Look forward to meeting you in the near future!